This summer, Sunoco is giving away $5,000 in free fuel to 11 grand prize winners. The Sweepstakes begins on July 1, 2016 at 12:00 a.m. Eastern Time ("ET") and ends on August 31, 2016 at 11:59 p.m. ET. Obtain A Decal: You will need to display a SUNOCO® Contingency Decal (“Decal”) on your motor vehicle. Affix the Decal to your Vehicle: Once you obtain your Decal, immediately affix it in a visible location on the outside of your vehicle (i.e. rear window or bumper). Stop by any participating Sunoco Station and pick one up for free. Request a decal on Facebook at www.facebook.com/gosunoco. 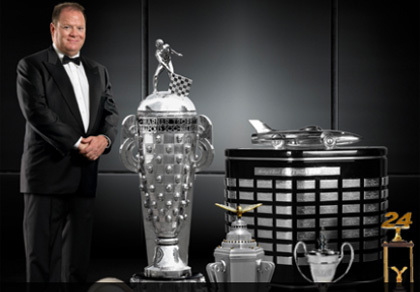 You can check back to see as they announce all of the Free Fuel 5000 Grand prize winners. For more prizes and chances to win, make sure to follow GoSunoco on Facebook! NASCAR Race Mom’s has teamed up with Sunoco to conduct a giveaway for her blog readers. One lucky fan will win a $25 Sunoco Gift Card (ARV $25.00). Ashlei, left, and Elissa, right, after taking a ride on the zip line. As campers and counselors gather behind the Adventure Tower, two girls raise their hands to volunteer to be the first in their group to zipline. Ashlei, 14, and Elissa, also 14, step into their harnesses, put on their helmets and take a swig of water before they approach the zipline platform. For Ashlei and Elissa, this was more than just ziplining; this was a competition. The goal: be the first one to reach the other side of the zipline platform. As the young ladies are secured onto the cable, camp counselors sang a rendition of the Backstreet Boys’ hit, I Want It That Way—in a slightly different key than the original—while lounging under the shade. “This is my fourth year at camp, and I love it,” said Elissa. The counselors chant the zipline song: “Feel the rhythm; feel the run. Step right up, it’s zipline time,” and just like that, the girls were launched into motion. Ziplining proved to be no challenge for Ashlei and Elissa; it was their favorite activity at camp. The only obstacle they didn’t predict, however, was climbing the steep hill to get back to the beginning of the platform. However, ziplining isn’t the only thing that keeps Ashlei and Elissa coming back to camp. When Ashlei and Elissa aren’t ziplining, you can find them teaching their counselors the art of hula hooping, perfecting their aim at the archery range and swimming at the waterpark. “I like [camp] because every time that I come, there is something different that you can do. Especially when you start getting older,” Ashlei said. At Victory Junction, it is their purpose to provide extraordinary kids with extraordinary experiences so they are empowered to look beyond their medical diagnoses and recognize their strength and courage. Ashley and Elissa, like many of our campers, don’t let any obstacle—whether it be a medical diagnosis or the steep hill at the zipline platform—stop them from coming to camp and showing us what it means to Be Your Campself. Costa makes its home on the sandy shores of Daytona Beach, the birthplace of stock car racing. The area is best known for its sun, sand, and one particular turn on a very unique track that all began back in the 1930s. Then, cars would race south down A1A highway and then turn north back up the hard packed sands of Daytona Beach. Now, as fans gear up for the next speed chase under the lights at Daytona International Speedway on July 2, Costa honors racing’s heritage with a new sunglass style, North Turn. 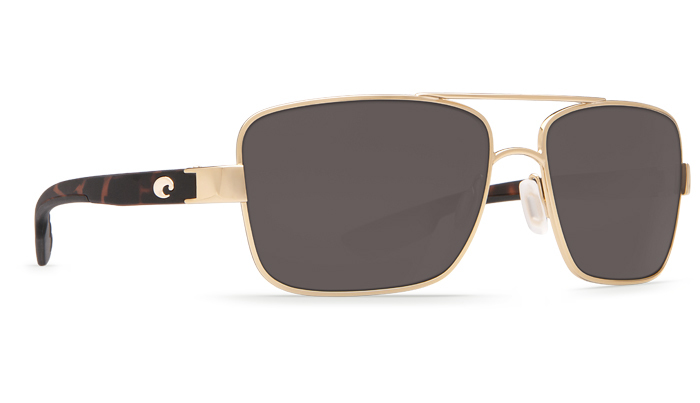 Costa’s North Turn is a bold metal frame with timeless styling. It features a large rectangular frame fit, comprised of quality Monel ® metal and nearly indestructible bio-based resin material sourced from the castor plant, a sustainable, hardy perennial. The bio-based resin produces increased durability, overall sunglasses weight reduction, and the ability for the frame to hold shape from extreme heat to bitter cold temperatures, crucial for anglers out battling the elements. Incorporating a bio-based resin frame construction reduces Costa's manufacturing process emissions, and cuts the company's overall carbon footprint significantly. North Turn is available in frame colors including palladium with shiny black temples, gunmetal with matte black temples, and rose gold with matte tortoise temples. The style also features sturdy integral hinge technology and adjustable silicone nose pads, for a superior comfort fit. Costa’s North Turn is available in gray, copper, blue mirror, green mirror and silver mirror lens colors, in Costa’s patented color enhancing polarized 580™ lenses. The brand’s 580 lens technology selectively filters out harsh yellow and harmful high-energy ultraviolet blue light. Filtering yellow light enhances reds, blues and greens, and produces better contrast and definition while reducing glare and eye fatigue. Absorbing high-energy blue light cuts haze, producing greater visual clarity and sharpness. Costa’s 580™ lenses, the clearest lenses on the planet, are available in either glass or impact resistant polycarbonate. North Turn is also available in customized prescription sun lenses. The style ranges in retail price from $199 to $279, with prescription sunglass prices varying. North Turn is now available at www.costadelmar.com, and at authorized participating Costa retail partners. 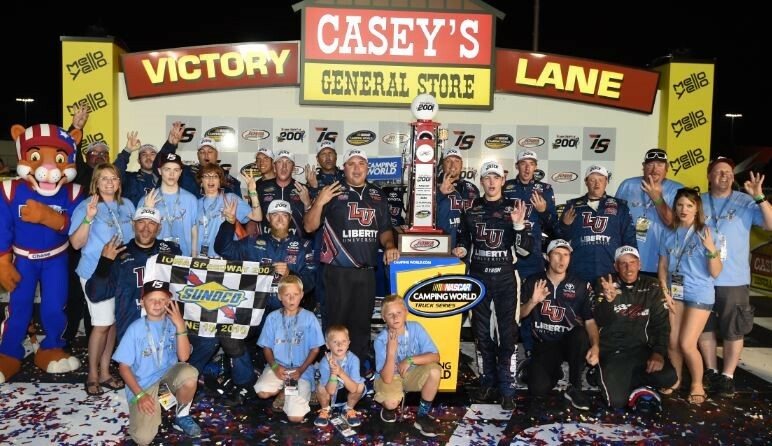 The NASCAR Foundation was thrilled to be showcased during the Speediatrics 200 at the NASCAR Camping World Truck Series (NCWTS) race at Iowa Speedway. This first-ever opportunity allowed the Foundation to highlight its Speediatrics Program, which is expanding to make children's health our biggest priority. Our efforts focus on providing much needed health care and assistance to children who need it the most. On Thursday, NCWTS driver Ben Rhodes visited Mercy Children's Hospital in Des Moines, delivering Speedy Bears to children. And on Saturday, the Foundation hosted two families from the Ronald McDonald House (RMH) of Des Moines for a VIP Experience at Iowa Speedway. The families started their day by taking a ride in the official pace car with a garage tour and visit to the MRN Hauler to learn how the radio broadcasts are put together. The day continued with being introduced in the Drivers/Crew Chiefs Meeting, greeting the drivers on the pre-race stage. The most famous words in racing - - Drivers Start Your Engines - - was delivered by Emmett (age 6) who has been staying at the Ronald McDonald House while undergoing cancer treatments joined by his brothers, Chandler & Tate (ages 10) and Alec (age 12). suite provided by Iowa Speedway and celebrated with race winner William Byron in victory lane. Emmett’s mom, Cora said, “the race was a new adventure for our family. We now have racing fans in our household and have already been asked "when can we do that again?" At The NASCAR Foundation, we are so happy to provide opportunities for children to take their mind off of an otherwise scary time in their lives. Hopefully, we can create ten more fans in the process! Spencer Gallagher issued an apology following an incident in the Drivin' for Lineman 200 at Gateway Motorsports Park. "I would like to take time to address my actions at Gateway Motorsports Park this past weekend. First, I would like to apologize to John Wes Townley. Additionally, to his team and fans, I am sorry. The incident earlier in the race was not intentional and certainly was not meant to cause bigger problems later in the event. My crew, who have worked so hard to get me to where I am this season, did not deserve to have their night ended in that way. My teammates and all of the guys back at the shop deserve more respect than was shown Saturday night. I would also like to apologize to my team owner, who wholeheartedly believes in this organization and expects all of us to perform at our best at all times, no matter the situation. And finally, I would like to extend a sincere apology to the NASCAR community - representatives and fans. I love this sport just as much as all of you and I am ashamed that I was part of an incident that has allowed so many to view what we do in a negative light." Gallagher and Townley collided twice during Saturday's Drivin' For Linemen 200 at Gateway Motorsports Park. The second crash eliminated both drivers from the race and triggered an on-track wrestling match after both drivers exited their crumpled trucks. Denny Hamlin finished second in Sunday's NASCAR Sprint Cup Series race at Sonoma Raceway, following a thrilling last lap battle with eventual winner Tony Stewart. Hamlin led a race-high 33 laps but was running second on the final lap behind Stewart after running him down following the final caution with 14 laps to go. Hamlin took advantage of a mistake by Stewart in Turn 7 and nudged his way to the lead. But Hamlin wheel-hopped the #11 FedEx Cares Toyota entering Turn 11, opening the door for Stewart to pull alongside, making contact in the process. The contact caused the #11 to brush the outside wall allowing Stewart to retake the lead, beating Hamlin to the checkered flag by 0.625 seconds. Hamlin started sixth and was running eighth when he made his second scheduled green flag pit stop at lap 45. As the FedEx crew was servicing the car, a well-timed caution waved. Since Hamlin was one of only two cars to pit prior to the caution, he stayed out as the rest of the lead lap cars pitted, catapulting the FedEx car to second for the restart with 61 laps to go. With track position at a premium, Hamlin would lead twice and race among the top-three for the remainder of the event, allowing him to make the last lap move on Stewart. The second place finish is Hamlin's seventh top-ten finish of 2016 season and moved him up two spots to 11th in the NASCAR standings after 16 of 26 regular season races. The series returns to action Saturday, July 2 at Daytona International Speedway. Clint Bowyer, a winner at Sonoma in 2012, was sidelined after completing just five laps by an electrical issue that filled the cockpit of his No. 15 Chevrolet with smoke. 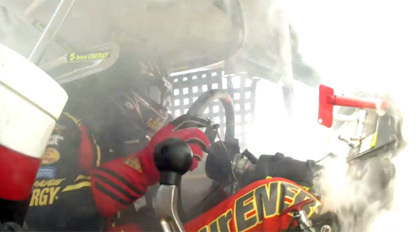 On Lap 5 of the 110-lap race, Bowyer’s HScott Motorsports Chevrolet had an electric fire, forcing him to stop on course in Turn 8. Clearly upset, Bowyer threw his helmet into the cockpit of his car. Seriously. In all the years. I've never had a shock catch fire. "All you’ve got to do is just give me that little bit of hope, and I’ll run with it.” Smoke. After winning Sunday’s Save Mart 350k at Sonoma (Calif.) Raceway, that adage is one Tony Stewart intends to fulfill to the tune of a berth in the 2016 Chase for the NASCAR Championship. Driving the No. 14 Code 3 Associates/ Mobil 1 Chevrolet SS for Stewart-Haas Racing (SHR), Stewart took the lead with 22 laps to go and sparred with Denny Hamlin on the last lap to score his 49th career Sprint Cup Series win, his third at Sonoma and his first since winning at Dover (Del.) International Speedway on June 2, 2013. This was also Stewart’s eighth Sprint Cup win on a road course, as he has five victories at Watkins Glen (N.Y.) International. “All of these wins are meaningful – it doesn’t matter where you get them,” said Stewart, now a three-time winner at Sonoma (2001, 2005 and 2016). “We ran close to those guys up front all day. It’s pretty ironic that the last win we got was in a Code 3 Associates car, and I’m proud to do it again. I’m really proud for all of our sponsors – Mobil 1, Bass Pro Shops and everybody. Stewart missed the first eight races of the season after injuring his back in a Jan. 31 all-terrain vehicle accident, but NASCAR granted him a medical waiver that made Stewart eligible for the 2016 Chase for the NASCAR Sprint Cup. To compete for the series championship, Stewart had to win at least one race and secure a position within the top-30 of the championship standings by the 26th race of the season Sept. 10 at Richmond (Va.) International Raceway. With the victory at Sonoma, Stewart checks one box on his way toward eligibility and seems likely to satisfy the other requirement, as he is only nine points behind 30th-place Brian Scott. Stewart was fast throughout the race weekend, posting top-10 lap times in both practices Friday, then qualifying 10th on Saturday. It marked his third consecutive top-10 qualifying effort. Once the green flag waved, Stewart wasted no time in showing his road-racing skills as he drove from 10th to seventh in the opening laps and executed a daring three-wide pass in the turn 11 hairpin. Stewart held his ground through the first round of pit stops, but he restarted 15th after the lap-38 caution that saw him pit while others stayed on the track or had quicker pit stops. “We are tight on the right-handers and loose on the left-handers,” Stewart told the crew, who made adjustments to correct the issues during the pit stop. The No. 14 struggled in race traffic on the restart, and Stewart was only able to make it to 14th by the time he pitted again on lap 70 of the 110-lap race. With 40 laps remaining, the crew told Stewart to “go get them for now” but warned that if the race went caution-free, they might need Stewart to save fuel. Stewart couldn’t gain much ground, so the team pitted once more with 25 to go. Although he dropped to 32nd, the team gambled that a caution in the final laps would enable Stewart to take advantage of track position and fresher tires. As it turns out, that’s just what happened one lap later when NASCAR threw the yellow for a spring rubber in turn seven. The caution brought most of the field to pit lane on lap 88, allowing Stewart to move to fourth. As the laps wound down the tension increased for drivers that wrestled their 3,300-pound cars on the 11-turn track in 90-degree temperatures, resting only during three brief cautions in the first 100 laps. During the final laps, Stewart put on a display of what has made him a power on the NASCAR road courses, holding off hard charges by both Martin Truex Jr. and Hamlin, trading the lead with the latter just once before coming to the checkered flag. The next event on the Sprint Cup schedule is the Coke Zero 400 Powered by Coca-Cola on Saturday. Drivers in the NASCAR K&N Pro Series West tackled their first road course event of the season with the Chevy’s Fresh Mex 200 at Sonoma Raceway on Saturday. The annual visit to the winding 1.99-mile track in Northern California’s wine country will featured two Bill McAnally Racing drivers. 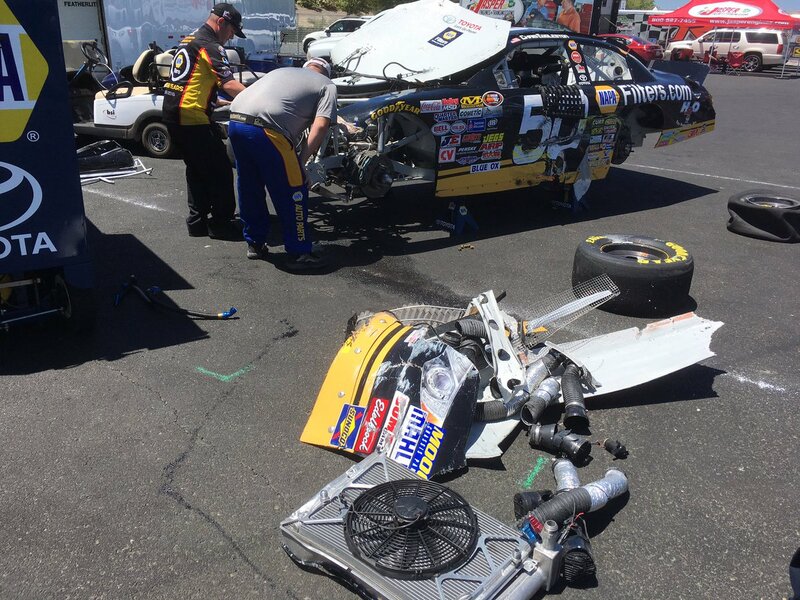 @ToddGilliland_ & @chriseggleston_ collected in first lap accident. 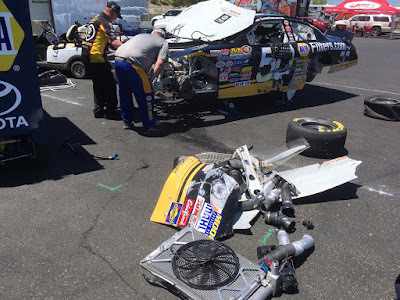 Unfortunately, defending series champion Chris Eggleston and the points leader going into the road race, Todd Gilliland were caught up in a multi-car pileup when the Green Flag dropped which sent both their race cars to the garage. Gilliland managed a twenty-fourth place finish (23 laps down) while Eggleston came in twenty-sixth (30 laps down). For Gilliland, this race was his first road course start. It is truly a shame that these two talented driver were taken out of contention so early and through no fault of their own. 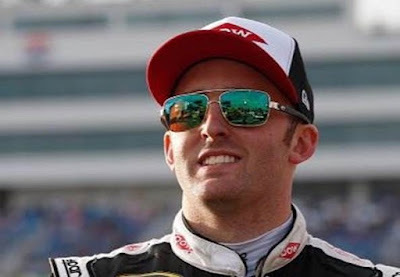 It would have been very exciting to see how they would have challenged the eventual race winner, the driver of the #24 NASCAR Sprint Cup Car Chase Elliott. The Chevy’s Fresh Mex 200 will be broadcast on NBCSN on June 30 at 8 p.m. PT. The NASCAR K&N Pro Series West will be back in action at Idaho's Stateline Speedway for the Toyota/NAPA Auto Parts 150 on Saturday, July 9. Caution Flags: Laps 3-5 (38 Stopped Frt Straight Engine - No FP); 32-33 (Half Way Break - #88 Free Pass); 39-41 (#88 Stalled on Track - No Free Pass); 45-47 (# 40 Accident - #11 Free Pass); 49-52 (#30 drove off Trk & stopped - #22 FPass); 55-57 (Debris on Front St. - #36 Free Pass). 6 for 18 laps. Lap Leaders: Chase Elliott 0, Ryan Partridge 1-7, Chase Elliott 8-13, Ryan Partridge 14-17, Gracin Raz 18-25, Noah Gragson 26-33, Gracin Raz 34, Noah Gragson 35-41, Gracin Raz 42, Noah Gragson 43-61, Chase Elliott 62-64. Total Laps Led: Noah Gragson 34, Ryan Partridge 11, Gracin Raz 10, Chase Elliott 9. 10 changes involving 4 drivers. (1) Chase Elliott, Dawsonville, GA, Chevrolet, 64 laps, 64.732 mph. (4) Noah Gragson, Las Vegas, NV, Ford, 64. (7) Gracin Raz, Lake Oswego, Ore., Ford, 64. (2) Ryan Partridge, Rancho Cucamonga, Calif., Ford, 64. (10) Riley Herbst, Las Vegas, Nev., Toyota, 64. (17) Michael Shawhan, Los Gatos, Calif., Chevrolet, 64. (23) Tom Klauer, Reno, Nev., Chevrolet, 64. 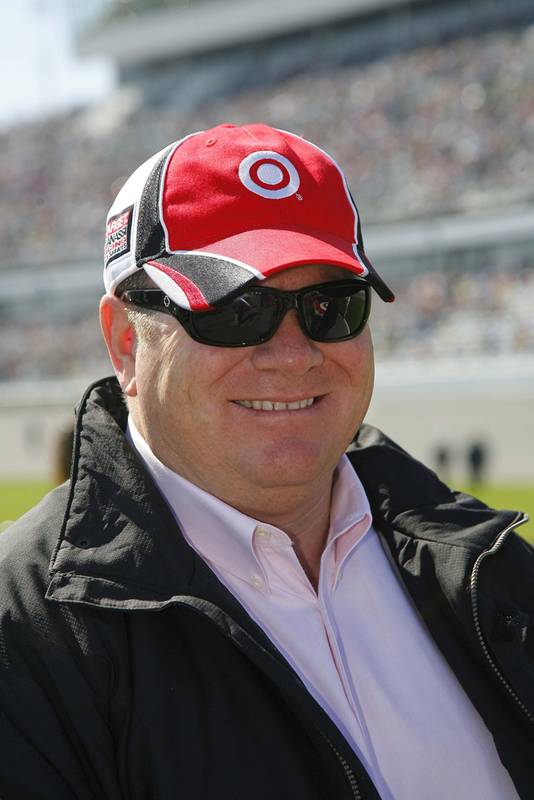 (20) Scott Ivie, Mountain View, Calif., Toyota, 64. (22) Carlos Vieira, Atwater, Calif., Chevrolet, 64. (8) Cole Rouse, Fort Smith, Ark., Ford, 64. (6) Julia Landauer, New York, N.Y., Toyota, 64. (21) Tim Spurgeon, Danville, CA, Chevrolet, 64. (26) Takuma Koga, Nagoya, Japan, Chevrolet, 64. (24) Matt Levin, Tucson, Ariz., Ford, 64. (27) Jesse Iwuji, Dallas, Texas, Toyota, 63. (15) Todd Souza, Watsonville, Calif., Toyota, 63. (9) Will Rodgers, Murrieta, Calif., Chevrolet, 62. (29) Rodd Kneeland, Sonoma, Calif., Chevrolet, 62. (16) James Bruncati, Glendora, Calif., Ford, 58, accident. (30) Jack Sellers, Sacramento, CA, Chevrolet, 50, accident. (19) Blaine Perkins, Bakersfield, Calif., Chevrolet, 50. (25) Ron Norman, Tucson, Ariz., Ford, 45, suspension. (14) Brian Wong, Newport Beach, Calif., Chevrolet, 44, accident. (5) Todd Gilliland, Sherrils Ford, N.C., Toyota, 41. (13) Alex Schutte, Redding, Calif., Ford, 38, suspension. (11) Chris Eggleston, Erie, Colo., Toyota, 34. (31) Rich DeLong III, Santa Clarita, Calif., Chevrolet, 2, suspension. (28) Stafford Smith, Eagle, Idaho., Chevrolet, 1, engine. (18) Johnny Borneman, Ramona, CA, Ford, 0, accident. (3) David Mayhew, Atascadero, CA, Chevrolet, 0, electrical. (12) Jim Inglebright, Fairfield, Calif., Chevrolet, 0, did not start.